As a mom, there is always something to pick up off the floor. Whether it be a dropped cracker, an article of clothing or a toy that is in the middle of the walkway...there is ALWAYS something to pick up. What bugs me the most is when my children drop their sippy cups or toys when they are in the car seat. I HATE THAT! It is soooo bad to try and grab a cup as it rolls by your hand...all while you are trying to drive! You know how it always happens...junior drops his cup, it rolls to the side and then proceeds to roll all the way under the seats to the very back of the car?!? UGG! Not fun. So, I am always thrilled when I find products to help me keep the children's toys and cups fastened to their seats!!! Ok moms and dads. I'm sure you can relate! I loathed playing the drop and fetch game with my kids! That's why I invented www.simplyonboard.com. 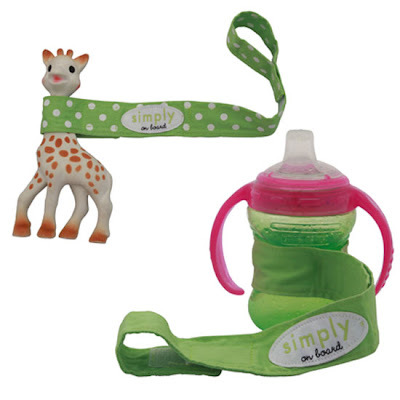 They are a stylish yet practical way to keep teethers (including Sophie the Giraffe), snack traps, plush toys, etc.... off the ground. Simply attach one Velcro end to the stroller, car seat, carrier...you get the idea, and the other end to the object of choice. This is such a great idea...especially since I am a mom of two children that are under the ages of three! For this review I was sent a package of two of these toy straps from Simply On Board and they are so cute! I received the black and white polka dot pattern. When I first opened the package and took out my straps, I was impressed by the length of the Velcro straps. The length is so that you can adjust your strap to fit whatever you are trying to keep off the floor. Recently, my 10 month old has found it very amusing to throw his sippy cup on the floor while in his high chair. So, mommy got smart and I decided that today was the perfect day to try out my Simply On Board! Because his high chair is solid plastic and there are no real places to loop the Simply On Board around, I decided to attach one end of it to the seat belt (which I don't use). Then, I wrapped the other end around the sippy cup. I think he thought I just gave him a new toy! He was FASCINATED with the strap...but could NOT throw his cup over board! YAY! I was happy...needless to say! The Simply On Board comes in different colors (blue, green, pink and black) so you are able to pick out the one that you like the best. These straps come in packs of 2 and cost about $9 per package...not bad at all!!! So, in my opinion...Simply On Board is a great product! It sure is a time saver for me...and is so convenient. I love how it adjusts to different lengths to fit different objects and is so versatile. The colors are very bright and eye-catching too...so you can prevent flying objects in style! Visit Simply On Board and tell me which color strap you would love to win and why you need one of these! You do not have to be a blogger to enter, but you must have a valid email where you can be reached should you win. If you do not leave an email address, it must be where I can easily find it. This giveaway is open to US & Canadian residents and will end 5/20 at 11:59 pm EST. The winner will be chosen using random.org and will be notified by email. The winner will have 48 hours to respond, or another winner will be selected. 6. Leave a comment on any non-giveaway post. 1 entry per post you comment on. Unlimited. 7. Vote for me on Picket Fence Blogs (Button is in the right hand column). 1 entry, can be done daily for 1 extra entry each day. Disclaimer: I received no monetary compensation for this post. I received Simply On Board toy straps for review purposes. All quotes are from the Simply On Board website and email. All thoughts and opinions are 100% mine. i'd choose green- i need one because my little guy will soon be tossing things everwhere! I love the green one..i need one asap for my girl!! i'd choose the blue dot. I can use this product because I have back problems and the constant bending to retrieve hurts. I thought pacifier clips were great! I'd pick the black & white polka dots to put on my son's teethers that he likes to toss on the floor. I follow you via GFC 1. I follow you via GFC 2. I follow you via GFC 3. I like the black poka dot strap. I'd like one because it would be nice not to have to try to reach the back of your seat while your driving! My daughter is at a stage where she throws EVERYTHING because it's fun. I need this because I need to be sane. Thank you! Oh, and I would love to get the green one. Liked Simply On Board on FB. Commented on Hawaii Kettle Style Potato Chip post! Commented on Walgreen's free collage post! black and white polka dots is cute for both boy and girl and since I just dont know what i am having yet. Like" Simply On Board on Facebook . I would get the green and white poka dots one. The reason why I need this is because I have 2 children under the age of 2! I like the lime green polka dot but I wouldn't care what colour it was if it meant I didn't have to pick something up off of the floor or ground! I like the pink one with white dots for my daughter. id get the black and white polka dots. i want to win because i'm tired of picking up stuff over and over. lol.